WELCOME to this issue of our newsletter, in which we focus on issues around human resources (HR) management. The HR challenges are political, economic, socio-cultural and technological. Globalisation, liberalisation and privatization, coupled with continuous changing technology, the nature of competition in the markets and gaps in skills and knowledge continue to pose major challenges to the management of HR in Africa. However, we can go around the challenges if we adhere to the philosophy of people management based on the belief that HR is uniquely important to sustained business success. An organisation gains competitive advantage by using its people effectively, drawing on their expertise and ingenuity to meet clearly defined objectives. Human resources management is aimed at recruiting capable and committed people, followed up by rewarding their performance and developing key competencies. Even in conditions of high unemployment, environmental constraints on re-sourcing results in shortages of people with skills that may be in demand. Under the circumstances, it is advisable to gain access to the labour market and to tap into the labour reservoirs. There is greater demand for high skilled workers than for low skilled workers. This shows that the HR function is clearly shifting from being a "service provider" to a business partner. The argument is that human resource managers/specialists should play a central role in resolving questions about how to attract, motivate and develop workers with scarce but critical abilities, and developing effective processes of work organisations. "Brain Drain" has resulted in a number of skilled staff leaving Africa for "greener pastures" overseas. As we make an effort to attract some of this vital resource to come back to Africa, HR experts in organisations in Africa are, therefore, urged to establish partnership with AfricaRecruit as a vehicle to lure these people back. We also urge HR managers and specialists to send in articles on experiences in human resource management and on the subject of tapping into the expertise of Africans in the Diaspora. Your articles will be published in the monthly electronic HR newsletter and the quarterly hard copy version. We also welcome feedback on how we can improve this newsletter. Over 2,500 Cameroonians from within and outside Cameroon were present at the Cameroon Careers day that was spearheaded by AfricaRecruit in partnership with ADRH Apave and Godin Martins Consulting ltd, both Cameroonian Human Resource consultancies with vast experience and understanding of the labour market. The rationale behind Cameroon Recruit, the first ever recruitment fair in Cameroon was to show case the human resource capabilities of Cameroonians living locally and in the Diaspora and give the candidates the opportunity to meet face to face with choice employers and vice versa. In addition, Cameroon Recruit was organised to enhance the quality of labour thereby improving on efficient and effective productivity. The event kicked off with a cocktail evening on the 8th of December. This brought together Human Resource personnel of attending organisations and some of the pre-selected candidates. Organisations met face to face with the candidates on the 9th and 10th, and some interviews were carried out. Organisations present at the fair included MTN, AES Sonel, BAT, Sonara, Nestle, Emploi Service, Ark View African Airlines, VK11 (an engineering professional body from the Netherlands), Institut Superieur de Technologie (IST), Oracle, and Merck. According to Lyna-Laure Amana-Priso, Director, Human Resources of MTN “the initiative was a good and timely one, which showcased that Africans are indeed taking their destinies into their hands”. She however expressed her concerns that this was a private sector initiative and the public sector in Cameroon needed to be more involved. 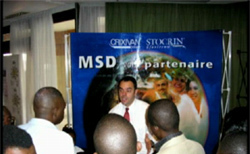 Romain Bessoin, Human Resource Manager, African Region of Merck Sharpe and Dohme Interpharma said that he was impressed by the volume and the average level of education of the candidates which was very high and also by the fact that majority of the people he met who did not meet his profile had dealt with HIV/Aids at one point or the other in areas such as volunteering or participating in HIV/Aids focused workshops. He also expressed sadness of seeing so many qualified people with no jobs and felt that a challenge was to find the root cause of the problem and address it accordingly. Likong JOB Geatan said that the event was a very good initiative though the concept is new for the environment. As a result, he thought that the organisers have to work harder to prepare it better in future in order to target the most adequate candidates. Emmanuel Wankoue, Employees Relation Manager of British American Tobacco (BAT) said that the initiative was both good and challenging and one that should be by all means continued. He said that it has given Cameroonians the opportunity to know that there are opportunities that do exist and that getting a job can be done based on the candidates capabilities and not only by their social networks. 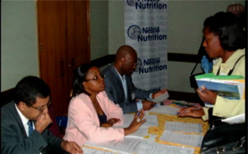 In the same light, another candidate interviewed by a one of the organisations said that the event made him aware that there are indeed job opportunities in Cameroon, which could be got based on credentials and capabilities. Dr Banjoko, chairperson of AfricaRecruit said that she was overwhelmed by the amount of candidates that attended the fair, though some of them were not qualified candidates for the prospective positions that were being advertised by the clients. According to her, this indicated that indeed the competent skills exist in Cameroon but there is a great challenge to match the skills with the needs of various organisations and opportunities that they have. This she said, could be addressed using a multi thronged approach that has to be addressed by the both the public (education, information, employment and labour) and private sectors. Though the event spanned over a period of two days, the organisers say that the relationship cultivated with the job seekers and the clients is a continuous one. As a result, candidates have been advised to visit the job web portal, www.findajobinafrica.com to access other job opportunities. Also, based on the wide acceptance of Cameroon Career day, they have pointed to the fact that, come next year, there would be another Careers day in Cameroon with greater involvement from Government bodies and the Central African Region beyond Cameroon. The Oracle Human Resources Management System (HRMS) supports progress through the four phases of workforce excellence: comply, automate, measure, and align. With Oracle HRMS you can: ensure compliance, provide self-service HR; assess performance; and recruit and retain the best employees. Click here to get a FREE white paper to learn more about workforce excellence. PAULINE Paledi-Mokou has joined AfricaRecruit as the human resources expert. Born in Botswana, Pauline has an Msc in Human Resources Management and Development from the University of Portsmouth (UK) and a Postgraduate Diploma from the University of West Connecticut (USA). She has worked at a senior level for more than 12 years in the fields of training, information and human resources development with private, parastatal and development organisations in the Southern Africa Region and brings in a wealth of experience in setting up human resources training, monitoring, evaluation and development programmes. Many Non-profit organisations do not establish a formal Human Resources (HR) function due to having a small number of staff and /or trying to achieve efficiencies. Rather, organisational staffs whose responsibilities lie within other areas are responsible for performing HR activities – such as recruitment, training, performance reviews, design and delivery of benefit programs and termination. Most typically, the finance staff, office manager or other administration staffs perform HR duties. While this may be the best option in small organisations, at a certain point the size of the organisation necessitates a separate, dedicated HR function. In sum, when an organisation reaches a critical mass – a point that varies depending on the specifics of the organisation – it is more efficient to have a dedicated HR function. As each department grows and develops, the potential is high for staff to identify only with the single department where they are employed instead of with a larger organisational entity. Providing strong, flexible and competent central HR services is key to creating a sense of cohesion and identity. Across departments or sites, the organisational cultures are very different. This is common in organisations with branch offices in multiple locations. The work of HR is people, processes and problem resolution. HR can effectively develop a vision to not only solve the problems of working with people, but also to anticipate and prevent them from happening. The finance or administration department may effectively handle the paperwork functions, but it cannot address the complex needs presented by the organisational configuration. Neither can the finance staff provide the higher end functions of strategic human resources such as training and development, employee relations, strategic planning and organisational development. To be effective, the HR function has to be seen as a strategic partner in the work of the institutes. HR in a complex organisation requires a very special skills set. It has to be firm in areas of policy, safety, quality and with the organisations core cultural values in order to bring some sense of cohesion and unity. The HR function has to find balance between the negotiable and the non-negotiable. Since HR has the core responsibility of risk management, it also has to know the departmental realities and employee relation issues, as well as the labour laws and insurance requirements in all sites of the organisation. HR needs to balance the management of employee risk with the development of tools, resources, training and policies that would increase organisational effectiveness. These are not mutually exclusive but one can err on either extreme. Be an ally in the work of management and staff, supporting the attainment of the organisation’s mission. Credibility is created when promises are kept and trust is built. It is grounded in honesty, openness and follow-through. HR becomes credible when its communications and actions are in harmony - in other words by “walking the talk”. Through this HR builds relationships and its reputation. This takes time. Competence is doing something well, and exhibiting knowledge and skill. To be effective, HR must demonstrate competence in everything it does. Compassion is showing care and concern for the organisation, its employees and stakeholders. HR must exhibit unwavering compassion and care in all situations. These three essentials are a high standard to meet but by carrying them out one step at a time, HR’s ability to influence management and staff in more difficult and challenging situations is greatly enhanced. When the HR function adopts these values and objectives, the staff will come to view HR as a resource and problem solver. In most cases, the decision to create an HR function is based on the desire to bring professionalism and competence to the “people issues”. Once this premise is attained, HR can become a true strategic partner in the organisation. My view is that it is HR’s job, though not HR’s job alone, to champion and shepherd effective human resources management practices at both the strategic and day-to-day levels. To be effective, HR’s practices need to be grounded in two ways. First, HR must reflect company wide commitments as to how it will manage and relate to its employees. Second, HR must follow through on such commitments in the moment so that the words of the enterprise and deeds of its agents are congruent. To be continued in next issue……….. The Eight Annual Africa Business Conference at the Harvard Business School.” Seizing Opportunities in Africa: A new Paradigm for the future"
As Africa continues in its quest for sustainable growth, styles of leadership, politics and economics are rapidly changing. Consequently new opportunities are beginning to emerge. Identifying and effectively sculpting these opportunities into real value generating business, institutions and nations will drive the evolution of Africa as it proves its relevance at the global table. Going forward, what innovative business models can Africa apply to generate products and services for those at the bottom of the pyramid? Are there fortunes for those who decide to focus their business offerings on attracting middle class clientele? What impact will factors such as debt relief, progressive economic reforms and changing transparency have on doing business in Africa? The goal of the Eighth Annual Africa Business Conference at the Harvard Business School is to welcome business professionals, policy makers, thought leaders and students to share their insight on new approaches and solutions to developing African businesses and economies within this new paradigm for Africa’s development”. For more information about the workshop and the conference please go to Africa Business Club website on www.hbsafricaconference.org or contact, Tariye Isoun on tisoun@mba2006.hbs.edu and for more information on AfricaRecruit and current projects please visit our website www.africarecruit.com or contact me on modupeakidele@africarecruit.com. "Mobilising the African Diaspora Healthcare Professionals for Capacity Building in Africa"
The year 2006 has been designated by the World Health Organisation as the Human Resource Year for Health, and by the United Nations as the Year of Migration. Also, in May of 2006, the Commonwealth Ministers for Health will meet in Geneva. Based on these events, 2006 promises to be a year of intensified discussions about what seems to be the continued depletion of Africa’s limited human resources, and the search for proactive solutions to the loss of Africa’s skills. Within this context AfricaRecruit will be facilitating a Healthcare Conference "Mobilising the African Diaspora Healthcare Professionals for Capacity Building in Africa" in London United Kingdom March 2006.